Still getting back my bearings after some travelling, so I'm going to keep this one short. 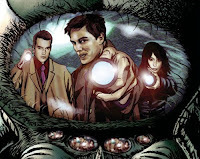 Oli Smith and Brian Williamson have teamed up to bring back the gang from Torchwood in this new online comic. It features Captain Jack, Ianto and Gwen so it presumably occurs between "Exit Wounds" and "Children of Earth."